I need 7 Yahoo answers for my site http://www.best-games-directory.com for seven different URL from this site. I will provide URL's and keywords. You can promote this link with question: What is the oldest Danish traditional slot machine operator: Tivoli Casino. You can promote this link with question: Where to find the best online bingo offers in one place? You can promote the above link with question: Where to check the world's biggest jackpot now and get free lottery ticket as welcome bonus! For above: What is the one of the best London-based sports betting exchange? Its WBX sports betting exchange where you will get up to $35 free bet as welcome bonus. For above: Where you can learn the basics of European Roulette game. 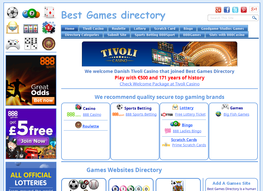 For above: Where you find the best online gaming directory, full of in-depth information? The above are propositions, you can do it your own better way. Hope that the keywords and URL's are okay for you. i am ready to post this 7 yahoo answers.... waiting for your order confrmation. as i am new to this so my prices are very low compared to others. give me chance at 1$ and i'll make sure you'll be happy and satisfy with my work. i been providing this service sir.. i'll give you 7 yahoo answers for your 7 urls. hope to work with you.